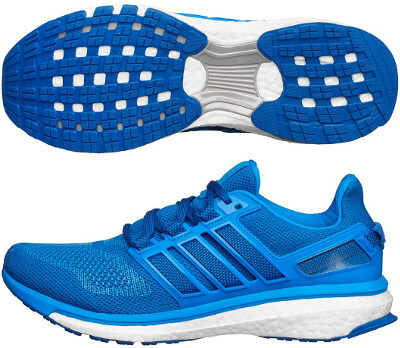 Adidas Energy Boost 3 are neutral cushioned running shoes. The Adidas Energy Boost 3 is everything but a standard running shoe and therefore difficult to define in a classic way. It was first released as a versatile running shoe: more cushioned than a performance one (like Boston Boost 5) and more responsive and lighter than a traditional training shoe (like Glide Boost 8), but current third edition seeks more stability and is significantly heavier (around 10%) than previous one. Well known Boost™ midsole with EVA layer on top of it is basically what the Energy Boost 3 keeps from its predecessor the Energy Boost 2. Much more AdiWear rubber is present into completely redesigned outsole looking for more durability and enhanced grip. Torsion® System features natural integrity in the midfoot for great stability and decouples forefoot from rearfoot units. Out of curiosity, it is ready to use miCoach® to track and improve your performance. Upper from Energy Boost 3 is based on lightweight, flexible and seamless textile TechFit® where the evolution of the 3D-moulded TPU FitFrame plays a prominent role increasing stability around the heel with a similar solution to the one seen in Vibram Five Fingers TrekSport. Other interesting change introduced after its success in the Ultra Boost is the rearfoot design (known as "S-Curve") which prevents slip issues and provides a better achilles protection.